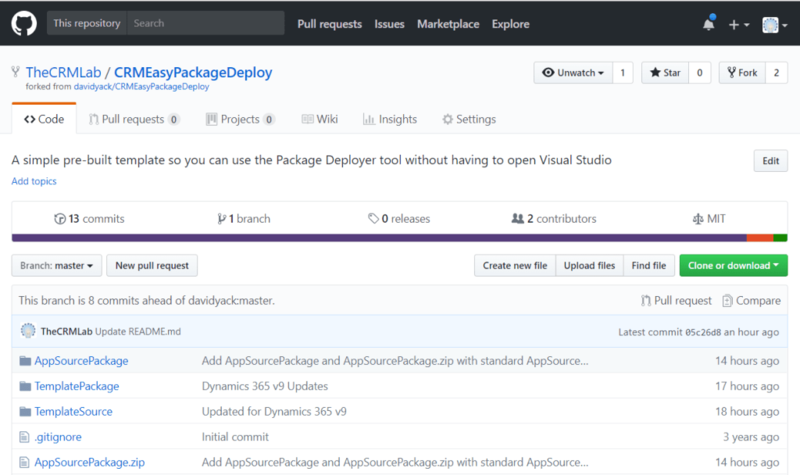 I’ve been working on a fork of David Yack’s CRMEasyPackageDeploy that includes an AppSource Package template for creating AppSource packages without needing to open up Visual Studio. The majority of the functionality comes from CRMEasyPackageDeploy. However, since I was planning to show creating an AppSource package for my presentation at CRMUG Summit EMEA in Dublin, I figured it made sense to have it ready to go and available as open source. Below are the instructions for using the template. NOTE: You may need to right click the downloaded zip file and select Properties -> Unblock File -> Apply in order to unblock the downloaded file. Follow the instructions provided in the CRMEasyPackageDeploy readme for editing the package elements in the package.zip file located in the root of the downloaded template. NOTE: You will need to extract the package.zip from the AppSourcePackage.zip in order to edit the files. Take note of the structure of the entire zip file to ensure that the package.zip only contains the files necessary and not a nested folder. Update the privacy.htm and terms.htm to include your privacy statement and terms and conditions for your app. Sample privacy and terms are included by default. That’s it. You’re AppSource package is ready for publishing. You can test your package locally using the same steps from CRMEasyPackageDeploy readme with the CRMEasyPackageTemplate.zip. Leave a comment if you have any questions or run across any issues using the package or create an issue in Github.